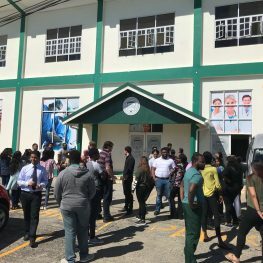 IAU had a fire drill on Wednesday February 28th. The purpose of a fire drill is to help prepare students, faculty and staff on how to exit the building safely and as quickly as possible in the event of a fire. Mr. Francis from the local fire department stressed the importance of the drill because it helps test how effective a fire evacuation plan is and how to improve. Students, in the event of a fire emergency, always stay calm & alert and follow procedure!